Marlowe's rise to become the greatest playwright in England. Marlowe finds himself in serious trouble with the authorities. Quotes from Shakespeare scholars spanning the last 200 years. Primary sources concerning Marlowe, and the events leading up to Deptford. 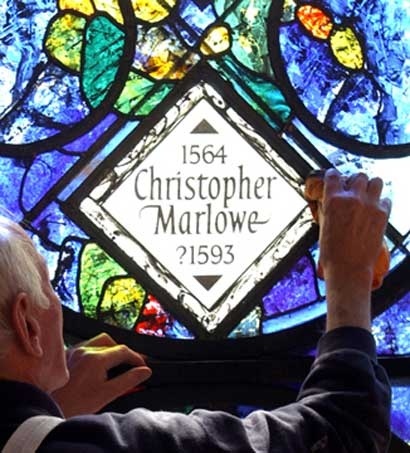 In 2002, Christopher Marlowe - the greatest playwright of his day - was finally given some recognition in Poets' Corner, Westminster Abbey, with a memorial window. 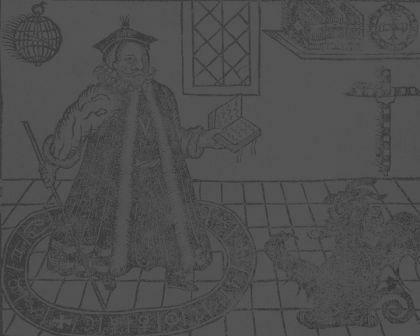 Much to most people's surprise, however, a question mark was included against the date of his death, 1593. Let's explore why the date of Marlowe's death might be in question. 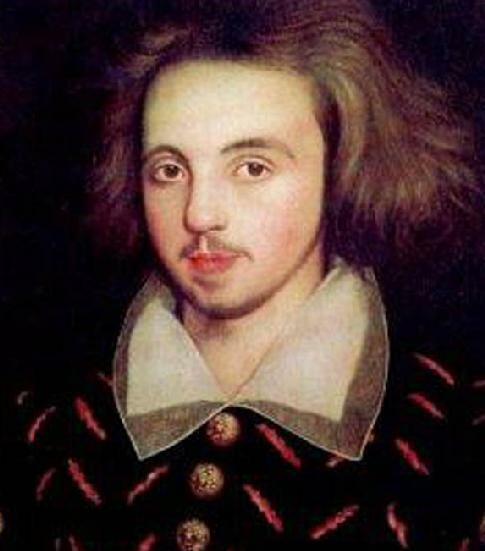 The report of Christopher Marlowe's inquest says he spent the day privately with three people - Ingram Frizer, Robert Poley and Nicholas Skeres - in a house near the Thames at Deptford. After dinner that evening a row erupted over who was to pay the "sum of pence" owing. Marlowe attacked Frizer from behind with Frizer's own dagger, and Frizer killed him in self defence. Pick any eight or nine of the scholarly books or articles written in the last twenty years about Marlowe's apparent death, however, and you'll find eight or nine different accounts of what really happened. It's one of those intriguing mysteries about which scholars find it almost impossible to agree. So why is this? We claim that it is because they are all trying to answer the wrong question. Instead of asking why Marlowe was killed, which yields this host of possible answers, they should be asking what the most logical explanation would be for those particular people to have been there that day. We say that by asking the wrong question they have missed what would be one of the most extraordinary, thrilling and mind-boggling stories in literary history. The point is that at that time Marlowe was in desperate trouble, accused within only the past few days of crimes which would lead possibly to his torture, and certainly his trial and execution. That the Queen's right hand man Lord Burghley had apparently been an employer and protector of his over the years would count for little, and his good friend Thomas Walsingham had even less chance of doing anything legal to save him. On the other hand, Robert Poley was one of the most experienced intelligence agents working within Lord Burghley's patch. Although en route from the Netherlands with urgent and important letters for the Privy Council, he was nevertheless "on her Majesty's service" during his stopover at Deptford. Ingram Frizer was a loan shark and confidence trickster, but also in the employ of Marlowe's friend Walsingham, with whom he would be closely associated for the rest of his life. And Nicholas Skeres, another con-man and therefore professional liar, was working with Frizer on their latest scam (from which Walsingham himself stood to benefit). There are also good reasons for being very suspicious about how genuine the inquest was. The Queen's coroner William Danby, a colleague of Burghley and former class-mate of Walsingham's father, had no legal right to be running it on his own, and it seems quite likely that the foreman of the jury was specially picked for the job. There is no evidence that there was anyone at the inquest - other than Frizer, Poley and Skeres - who could have identified the corpse. Given this situation, we claim that their attendance for any sort of social or business meeting can be rejected quite easily, and that any suggestion of all three of them being there to murder him simply cannot be logically supported. The only logical explanation must be that they were there to fake his death, and the fact that there was indeed a corpse lying there at the end of the day would have been an essential part of this scenario. Full supporting evidence for the "faked death" claim can be found on Peter Farey's website in his essays "Marlowe's Sudden and Fearful End", "Was Marlowe's Inquest Void? ", "Was Marlowe's Inquest Void? (2)", and "The Deptford Jury". Think the idea of faking one's own death is unusual? What do Shakespeare scholars say about Marlowe? Is there a problem with Shakespeare?